Our most popular event is loved by all teams. This is a scavenger hunt style activity that will tick all your boxes. It suits all team sizes, gets your group outdoors and is just competitive enough to make the result interesting. 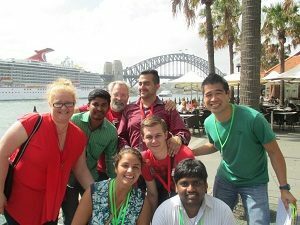 With 9 fantastic courses in Sydney, more than likely, Amazing Race will be ideal for your group. 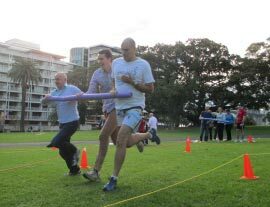 Created by Team Bonding for returning clients, this event suits large groups who want a varied, fun event with lower physicality than our Mini Olympics. Our “best of” event features portions of the Mini Olympics, Paparazzi and Fun & Games. It is one of our best events, perfect for diverse teams who want something everyone will really enjoy. The Mini Olympics is high energy, fun and inclusive. 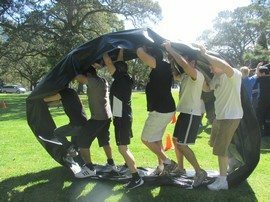 Ideal for active groups, your team will have a brilliant time competing in 15 of Team Bonding quirky challenges. Using equipment designed specifically for fun, everyone has a great laugh, you are in danger of going home with your sides sore from laughter …..